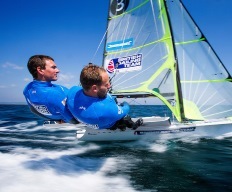 Brits Dylan Fletcher and Alain Sign believe they can spring one of Rio 2016's biggest sailing shocks as their quest for 49er glory gets underway on Friday (12th August). Fletcher, who grew up in Market Harborough, and Portsmouth-based Sign make their Games debuts 10 years after commencing their partnership in the Olympic skiff class and the pair head to Rio with a 2016 Worlds bronze medal to their credit. Yet they know if they are to achieve their ultimate ambition of topping the Rio podium they are going to have to put a halt the Trans-Tasman class dominance of London 2012 silver medalists, Peter Burling and Blair Turke (NZL) and defending Olympic champions, Nathan Outteridge and Iain Jense (AUS). After London the Kiwis won 27 straight events, including four world and two Test Event title, before finishing third at last month's South American Championships, behind the Aussies and Poland's Lukasz Przybytek and Pawer Kolodzinski. But Fletcher, 28, and 30-year-old Sign were involved in a relentless selection battle that went to the wire for the one British 49er berth for Rio, and they believe that will stand them in excellent stead to upset the formbook. Fletcher said "It's impossible to put into words the desire there is to win a gold medal. I think we're one of the few teams that can beat the Kiwis and we’ve known that all cycle. We’re one of the only teams that has come close to them, we maybe even rattled them, so hopefully their purple streak’s going to come to an end. Both Fletcher and Sign came through the RYA Youth pathway, enjoying great success in the 29er class, including a World Championship crown for Sign in 2004 and Worlds silver for Fletcher two years later. Since teaming up in the 49er in 2006, their 10 years together have yielded this year’s Worlds bronze, two European Championship titles in 2011 and 2013, plus bronze from the first Rio Test Event in 2014 too. Now the best friends are relishing the chance of capping a memorable decade with one of the biggest prizes in sport. The 49er class is scheduled to contest a 13 race series, with three races per day on 12, 13, 15 and 16 August before the final one off medal race on Thursday 18 August.